Victoria Express train is the best train in terms of comfort and services from Hanoi to Laocai, Victoria "Orient Express" stylish train offers one restaurant and two luxury sleeping carriages, all with air-conditioning. This is not a separate train, but rather part of the regular run (LC5 and LC6) between Hanoi and Laocai. Due to the increasing popularity of this train, the hotel only offers tickets to those staying in the hotel. We recommend booking your berth (and your hotel room) at least 30 days in advance. Dining car: Serve Vietnamese & European food. - All rates are in USD, inclusive breakfast, VAT & service charges. - Tickets will be delivered to your hotel in Hanoi. Note: Customers aboard the Victoria Sapa carriages can select to remain on board until 7 a.m. to catch a little more sleep. Tulico train offer comfortable, air-conditioned soft sleepers. While this is not a luxurious train, it offers good alternative transportation to Sapa from Hanoi. It has soft sleepers, A/C and clean four-berth cabins. You will be provided with one bottle of water, a small snack and a napkin. 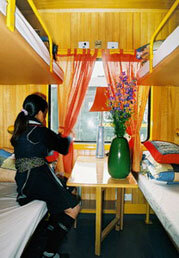 In the LC5 and LC6, there are Victoria Cabins, Tulico Cabins, Pumpkin Cabins, and Ratraco Cabins. All of these are alternatives for tourists to Sapa from Hanoi. Ratraco train is one of the best trains to Sapa with wooden cabins. Pumpkin train, like the Tulico train, is not a separate train, but offers soft sleepers, A/C and clean four-berth cabins in 2 carriages which go with local trains (LC5 and LC6) between Hanoi and Laocai. Pumpkin train is one of the best choice for tourists to Sapa. To serve tourist requirements, the Royal Train is also part of a regular train with 2 carriages in SP1 and SP2 which offers A/C, soft-sleepers and clean four-berth cabins. The Hanoi - Laocai train stops at Valley Laocai, just 40 km from Sapa; in order to reach Sapa, you will need to travel an hour and a half more through a connecting bus or private car. The bus stops at Sapa's main Post Office, leaving you with some minutes walk into town. It can also stop at your hotel, depending upon the location of the hotel. Ticket prices for connecting buses Laocai - Sapa are 30000VND or US$2/way. The tourist bus back to Laocai leaves from outside Sapa's church, but usually it can pick you up at your hotel. You can inquire with the staff at your hotels for getting a bus ticket back to Laocai Railway Station. - We recommend that you choose the soft sleeper and the Pumpkin, Ratraco, Royal, Tulico trains for cleaner cabins and berths. Normal train can easily buy at train station in Hanoi train. - We only can purchase the return tickets from Hanoi for the Victoria Express, Pumpkin, Tulico, Ratraco, Royal train. For other normal trains, you need to purchase the return ticket yourself, when you are in Laocai or Sapa , or request the hotel to buy it for you (you cannot be guaranteed a soft sleeper if you buy on short notice). - Child fare: under 5 years: free of charge if sharing bed with parent; 5 years/up: adult rate. As a Travel Agency, we can obtain Victoria Express, Pumpkin, Tulico, Ratraco, Royal train tickets at contract prices, so our fares are cheaper than buying them any where else.